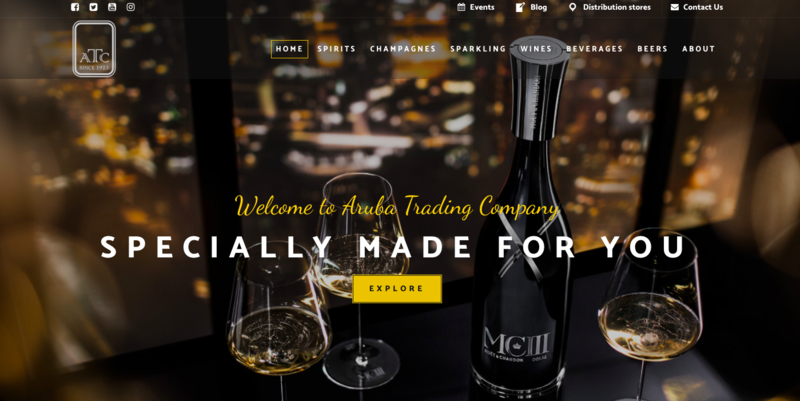 A New Website for Aruba Trading Company! Everything we do here at Aruba Trading Company is for one and only one purpose: To better serve YOU, our loyal customers! That’s why we’ve been working on launching this brand new website that we think you’re going to love. Our history goes back six generations, starting with merchant sailor Eliau Moses Curiel around 1860. After his passing, his son Morris E. Curiel sold the last of his father’s merchant schooners, “El Tigre” in 1882 and established his first store “La Casa Amarilla” (Yellow House) in 1887 in Curaçao. This was just the first of many Curiel companies to follow. Unique Brand Pages:Each brand we represent is unique, and we felt it was only appropriate to make sure each brand page was representative of the look and feel of that brand. You’ll find pages for various brands of spirits, champagnes, wines, beers, and other beverages as well. Easy Navigation: We designed the new website in way that ensure easy navigation with an intuitive layout. After all, what good is a website if you can’t easily find what you’re looking for? Social Integrations:You’ll easily be able to connect with our social media pages with icon links at the top of each page to our Facebook, Twitter, YouTube and Instagram channels so you can stay up-to-date on all the news, events and special deals at Aruba Trading Company! Event Calendar:We have lots of events, many of which include raffles for prizes, and our events calendar will keep you informed of our upcoming events and deals so you won’t miss anything exciting! Distribution Map:Where can you buy the many fabulous brands we represent on One Happy island? Just visit our distribution map to find an outlet near you! Blog:And finally, our blog page is another place to keep up-to-date with news and other information about Aruba Trading Company so you’ll never miss your opportunity to engage with us and the brands we represent! Take a few minutes to check out everything on our new website has to offer at arubatrading.com!